Last year, we were told my dad has CANCER and it forever changed our lives. Before then, cancer was something I knew very little about. I did have some friends and family affected; and all I knew was that some won their battles, while others didn’t. I still know very little about cancer— but what I do know, I’d like to share. I’m not an expert, or a doctor; I’m just a daughter who has spent the last 9 months caring for my father with gastric adenocarcinoma. Gastric adenocarcinoma is a cancerous tumor in the stomach. In the US, there is very little research, funding and preventative measures devoted towards it even thought it’s the second deadliest cancer in the world. Therefore, there are no medical standard guidelines when diagnosed. 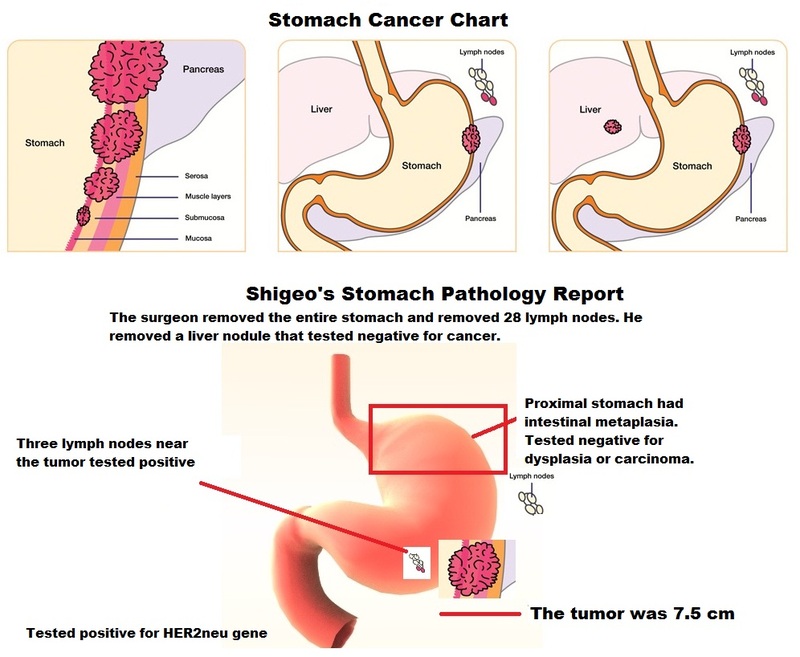 Staging the stomach tumor is similar to staging other cancerous tumors using the TNM system. T is for Tumor: T followed by a number (0-4) describes the size of the tumor and how many layers it has broken into. T4b (the max worst) means that the tumor broken through the stomach wall and touches another organ. N is for Node: N followed be a number (0-3) describes the amount of cancerous positive lymph nodes involved. N3B (the max worst) means 16 or more lymph nodes are involved. M is for Metastasis: M followed by a number (0-1) describes whether the cancer has spread to other parts of the body. The cancer can spread locally to the organs closest to the stomach or as far as the brain, colon or bone. Once the TNM is established, then we can Stage (from 1-4 and a lower case letter) the cancer. My father was diagnosed at T4a, N2, M0. Therefore, he has Stage 3B. Stage 4 is the worst because it means the cancer has spread. If a patient has stage 4 cancer, the doctor needs to find the origin of the cancer. For example, if the cancer was breast cancer that metastasized to the stomach; it is called breast carcinoma to the stomach. The origin of the cancer is very important in developing a treatment plan. Statistically, stage 4 stomach cancer 5-year-survival rate is 4% while stage 4 breast cancer 5-year-survival rate is 22%. Now the biggest problem and the most frightening is: When the cancer comes back. Hopefully, one day they’ll be a cure….. just wish it was today!! Shigeo’s Fight — A journal beginning from the day my dad had a total gastrectomy in an effort to cure to present day.